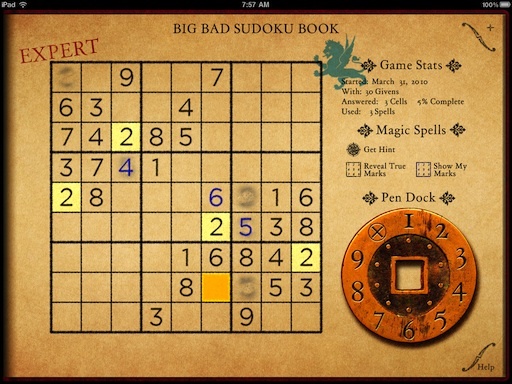 Highlights in Big Bad Sudoku Book are a revolutionary way to see and solve sudoku puzzles. With highlights you can softly highlight cells, rows, or columns with the swipe of a finger. They help focus your attention and narrow down possibilities. You can use highlights to temporarily mark positives or negatives, but more often they can be used to keep track of where an answer can’t go. This means that all of these highlighted cells can not be 7’s because there can’t be more than one instance of any number in any row column or block. From this you can easily find what cells are left to hold 7’s – the ones not highlighted. After filling in the 7 in that first block (shown here in red), it also eliminates that first column and points to the location of the next 7. Continuing this narrows the search down even further. Of course using highlights is completely optional – but it’s there when you need it. 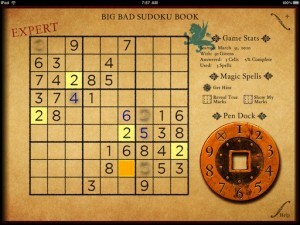 To clear all highlights tap anywhere outside of the puzzle area.